This show is as close to watching a cartoon as there ever will be! Bright, loud, colorful, full of inside jokes that I didn't get because I never watched SpongeBob but nonetheless - funny as hell. Sound effects as the characters walked (Squidward), rapid screen swipes as action moves from character to character and digital projection GALORE! Costumes were out of this world, since I don't watch SB I don't know who all of the characters are, but the audience sure did and gleefully clapped as each character was revealed. 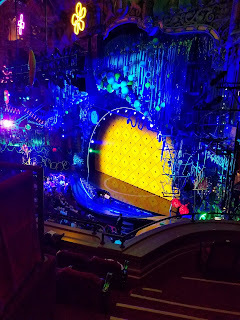 So much technology in this show it was astounding - digital projections that moved around the stage live, neon everywhere, junk everywhere, exactly what you would think Bikini Bottom would look like. It's interesting to see how digital projection has grown. I remember seeing the Lady in White (Andrew Lloyd Webber) in London, which was a big blank stage where they projected everything, and imagining back then how far it would progress - it seems as though you can't go to a show now where there isn't some kind of digital projection - it really helps move this show along. Flanking the stage are two huge Rube Goldberg machines that spew out lava balls - unfortunately it only got used twice, I would have liked to have seen more of that. The stage was built out, reaching out into the audience and covering the orchestra pit with ramps connecting each side; surrounding the stage and hanging above were all kinds of floatsam and jetsam that you would expect to see in the ocean. ALL of the actors had, in my opinion, strong clear voices and they did great justice to all of the different songwriters, including doing the voices of the characters that so many people know so well. 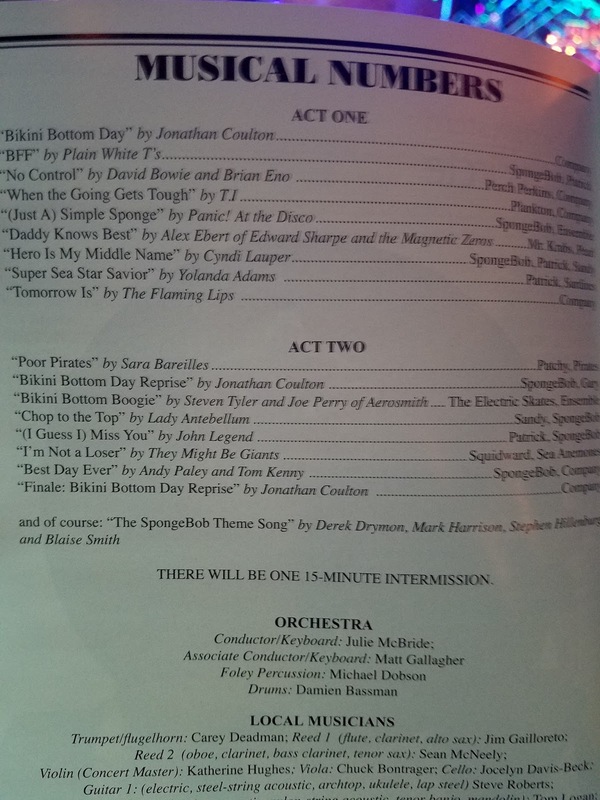 I'd completely forgotten that Gavin Lee was playing Squidward. Who's Gavin Lee? He played Bert in the Broadway and then touring production of Mary Poppins. Songwriters: there were twelve famous songwriters amongst the 15 songs, Plain White T's, Cyndi Lauper, David Bowie, John Legend. I was concerned that it might sound more like a juke-box musical with so many different styles of songwriters - but there was no concern at all, each song flowed easily to the next and none seemed out of place. My FAVORITE number was "I'm Not a Loser" which was Squidwards big song written by They Might Be Giants. A huge production number where it seemed that the entire cast (men included) donned huge Vegas style show girl costumes replete with big feathered head dresses and a big tap number (I'm a sucker for tap). 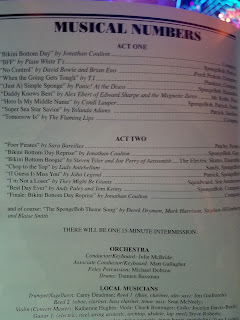 Several of the songs I was bopping along or tapping along at which point I would catch myself and say "why are you doing that, you never watched this show?" My favorite song was No Control by David Bowie and Brian Eno, within a few bars of the start of the song you KNEW it was a Bowie song. Dark, twisty and the perfect way to start off the conflict of the show. The choreography was really good, especially the tap number - they were ALL in sync for a show that's only been out for a week. There were skateboarders and roller skaters that used the ramps in front of the stage and there was even a mini-pirate show to kick off each of the acts. There was so much going on in this show that it really was like being in a cartoon. I'm definitely not the target audience for this show, but the youngin's sitting around us definitely LOVED IT! Everytime a character was introduced they'd go wild, when the actors would say or do something, people lauged. Apparently it really fed right into the appetite of that target because the young ladies sitting next to us couldn't get enough, whereas the older couple sitting next to us never came back after Act One. I surprised myself how much I liked this, so much so that when intermission came I didn't ask the question: Do you want to stay for Act Two? 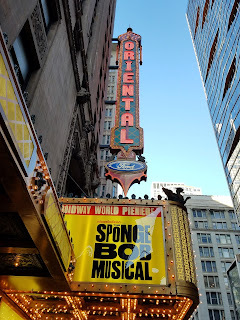 I sorta wanna see it again, if it makes it to Broadway it's going to be a big hit with those that love SpongeBob! Thanks so much for this review, Michael! You and I usually have similar reactions to the play. When I heard you were seeing this, I was waiting to hear what you thought. I'm glad to hear it was really good! I am a real BIG fan of SpongeBob, so I hope I will enjoy it just as much as you did! One question....where did you sit? I actually liked it a lot more than I thought I would! Since they've been having trouble selling tickets they upgraded my season tickets - I'm typically in the back back section of the balcony. We were siting in Row H in seats 362/364 which are on the first aisle stage left of the balcony (not the loge). We had fairly good seats, we just couldn't see the back right side of the stage. I'm glad you liked "I'm Not A Loser", cause Squidward is the best character on the show. Is this the start of the Apocalypse?